You are currently browsing the The Pet Product Guru blog archives for the day Sunday, March 25th, 2018. Giving your cat a pill can be a real task. Cats are fussy little creatures and even getting them to eat their regular food could be a very difficult. Imagine giving a finicky cat a pill? My cat Molly had to take many different kinds of medications several times a day. Her medication consisted of pills, powders and gels. There were times when she would take all of her medication without any problems but some days, she refused to take anything. Luckily most days she would take her pill in a pill pocket which she thought was a treat. Some days, she even refused to take the pill pocket. I would plead, beg, get on my knees and do anything to coax her to take the pill pocket. No such luck, when she refused, she refused. I anticipated that this situation may occur at times so I also got that medication in liquid form. Administering medication in liquid form can also be difficult but with some help, a quick squirt down into the throat will do the trick. 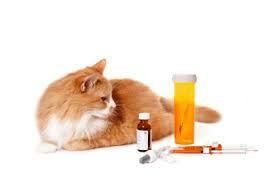 The easiest way to administer medication to a cat, is to mix it into their food. In order that your cat gets all of the medication, you have to make sure they eat all of the food. Most cats like to nibble. Molly would eat a little and when the food dried out, she wouldn’t touch it anymore. So what I had to do, is crush her pill, mix it into a very small portion of wet food and make sure she ate all of the food. I had to do this several times throughout the day. I’m not going to lie to you, it’s no easy task to give a cat medication but with persistence and lots of experimentation you’ll find a method that best works for you.